﻿ Portwell Releases A Basic Com Express Module Equipped With Intel® Skylake Processors- Portwell, Inc.
Portwell, Inc., (http://www.portwell.com.tw), a world-leading innovator in the Industrial PC (IPC) market and a Premier member of the Intel® Internet of Things Solutions Alliance today announces the release of the PCOM-B637VG, a Type 6 COM Express Basic (125mm x 95mm) module based on the 6th generation Intel® Core™ processor (codename Skylake) and Intel® Q170, H110 and C236 Express chipset. The Portwell PCOM-B637VG COM Express module includes Intel® Turbo Boost Technology for Core™ i5 and i7 processing, Intel® vPro™ Technology is supported with Q170 chipset for superior remote capabilities and Intel® Hyper-threading Technology for Core™ i7 processing. It also supports new advanced features offered by the 6th generation Intel® Core™ processors that boost IoT designs from the edge to the cloud, including Intel® SGX (Software Guard Extensions), Intel® MPX (Memory Guard Extensions), additional HSIO (High Speed Input/Output) with increased flexibility, and expanded HW/GPU accelerated codec support. In addition, the PCOM-B637VG delivers greater graphics performance, stunning Ultra HD 4K display across three independent displays, as well as faster 3-D and video playback capability, all while with improved energy efficiency. These enhanced features and performance translate into improved security and reduced manageability cost, making the Portwell PCOM-B637VG an ideal solution for Medical Healthcare Systems, Military Equipment, Retail Systems and IoT application design across a broad spectrum of industries. Specifically, the PCOM-B637VG COM Express module supports up to 32GB ECC (supported by C236 chipset only) & non-ECC DDR4 up to 2133MHz on one 288-pin SODIMM socket making it faster than its predecessor. Its expansion interface supports one PCI Express x16 Gen3 (8.0GT/s) for enhanced video performance,1.6 times faster than the previous Gen2 (5.0GT/s), and eight PCI Express x1 Gen3 (8.0 GT/s). Furthermore, The PCOM-B637VG supports three independent displays, DP (DisplayPort), VGA and LVDS with greater 3D performance compared to its previous generation. Running with a low TDP CPU (35 watts), the PCOM-B637VG can provide superior performance in various environments. Portwell's clients know they can always count on us to provide them with a quality product and long term support with up to date know-how. Designed with flexibility, the PCOM-B637VG is developed on a basic 125mm x 95mm platform, and with the Intel® Q170, H110, and C236 express chipsets functioning smoothly with 6th generation Intel® Core™ processors. These features allow our customers to preserve their legacy components and subsequent investments while minimizing turn-around time - all of which ensures that the costs of inevitable upgrades are minimal. In the Military and Medical sectors, safety with accuracy and precision are paramount, while in the Retail Market safeguarding investments by lowering costs of future designs is the status quo. As the markets change, Portwell's versatile COM Express modules adapt to these changes by enabling designers to partition commodity host-processors from proprietary baseboards, thereby minimizing current and future design risks during the initial phase of development. This design of separating the CPU-upgradable module from system specific I/O carrier boards further safeguards development investments and lowers total cost of ownership. In addition, Portwell can also provide services to clients on the carrier board design and development, review schematics and BIOS customization. At Portwell, we strive to create superior products for our customers. PCOM-B637VG is Portwell's first module with desktop CPU. It provides customers four important factors, high performance with affordable cost, DDR 4 memory support, Gen 3 PCIe support, and 30% faster graphic performance. The desktop CPU on module is a new idea which offers customer higher computing power but lower cost comparing to mobile solutions. The DDR4 support is also another important point for higher performance. PCOM-B637VG can support both ECC and Non-ECC DDR4 by different PCH SKUs. This is good for different applications. The Gen 3 PCIe support provides faster PCIe speed so that the performance of PCIe devices will be better. It is crucial for Networking and Medical related applications. 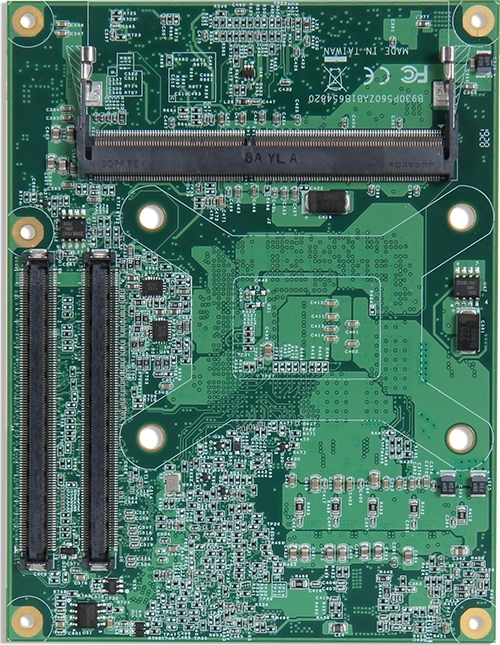 PCOM-B637VG provides one PCIex16, eight PCIex1 (Option to one PCIex4), four USB 3.0, and four SATA3.